• The Generals wrap up the final series of the first half with the finale of a 5-game home series with the Jacksonville Suns (3-1)…have won 9 of 13 to start month of June…have won 3 straight series over Huntsville (3-2), at Birmingham (3-2) and Jacksonville (3-1)…5-3 vs. Suns this season. • The Jacksonville Suns exacted their revenge on the Generals for the first 3 games of this series as they pounded out 16 hits and scored 12 runs to earn a 12-4 win Saturday in Jackson. • The game was played in front of the largest crowd of the season, 6,413 at The Ballpark at Jackson. • Starter Stephen Landazuri suffered the loss drawing his first start since April 22nd. He allowed 7 runs on 6 hits in just 1.2 innings. Moises Hernandez (0-4, 5.87) came out of the bullpen for 2.1 innings and gave up three more runs on five hits. Cam Hobson (4-5, 3.28) pitched well in relief as the Suns only scored twice on five hits over the final 5.0 innings with Hobson on the mound. 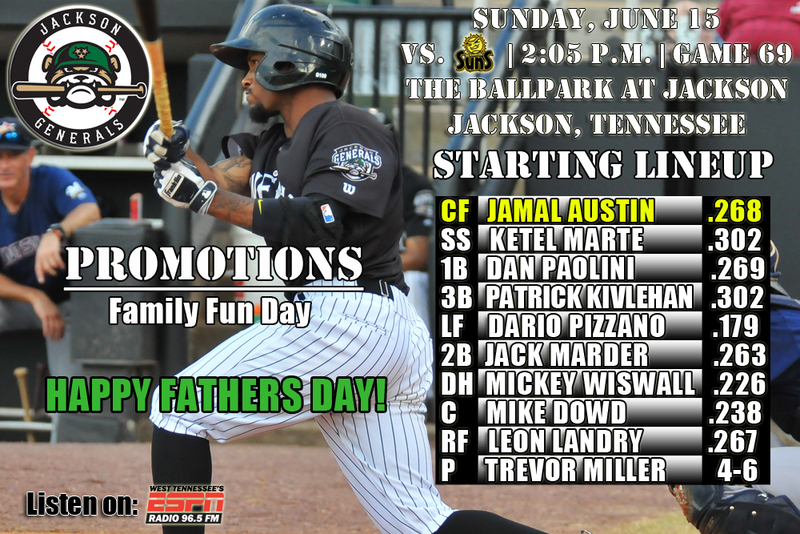 • Jackson had 10 hits as DH Jamal Austin extended his hitting streak to a team-high 13 games and 3B Patrick Kivlehan extended his on base streak to 23 games, currently the longest in the Southern League. • 3B Patrick Kivlehan currently has an 11-game hit streak, batting .475 (19×40) with 7 runs scored, 6 doubles, 1 home run, 13 RBI, 5 walks and 1 stolen base. After going just 4-for-35 in his first 10 Jackson games from May 10-21, Kivlehan has reached base safely in 23 straight games since May 22, batting .383 (31×81) with 12 runs scored, 7 doubles, 1 triple, 3 home runs, 21 RBI, 12 walks and a .453 OBP. He has raised his season average from .114 to .302. • On Top of the League in June – The Generals own the league’s best record at 9-4 in June. The .323 batting average leads the league in June. This is after posting the first 20-loss month since June, 2007 by going 9-20 during the month of May. • Need For Speed – After 3 more steals during Friday’s doubleheader the Generals now lead the league with 68 steals as a team this season. OF Jamal Austin ranks 4th in SL with 19. • OF Leon Landry has recorded 5 2-hit games, while extending his hitting streak to 8 games. During this 8-game stetch, Landry is batting .433 (13×30) with 8 runs scored, 4 doubles, 1 triple, 1 RBI, 1 walk and 2 stolen bases. • OF Jamal Austin currently has a 13-game hit steak, batting .404 (21×52) with 13 runs scored, 4 doubles, 1 triple, 4 RBI and 5 stolen bases. Austin has also reached base in a SL best 14-straight home games batting .333 (18×54) with a double, triple, RBI and 3 walks. • C John Hicks is batting .352 (31×88) with 15 runs scored, 7 doubles, 1 triple, 2 home runs, 12 RBI, 7 walks and 4 stolen bases in 24 games. During this stretch, since May 6, he has raised his season average from .219 to .296. • OF Kevin Rivers has reached base safely in 14 straight home games batting .290 (14×49) with 8 runs scored, 2 doubles, 2 tripls, 1 RBI and 9 walks. • RH Matt Anderson is 2-0 with a 2.30 ERA (7 ER, 27.1 IP) in his last 5 starts. During this stretch he has limited opponents to a .271 average (29×107), while walking 7 and striking out 20. • SS Ketel Marte has hit safely in 17 of his last 18 games, batting .320 (24×75) with 12 runs scored, 5 doubles, 1 triple, 11 RBI, 1 walk and 3 stolen base.. Marte currently ranks 8th in the league in batting (.302), 4th in hits (76), T-3rd in doubles (18), and 5th in stolen bases (16). • Jacksonville 1B Rich Poythress returns to Jackson this week as now a member of the Miami Marlins organization. • Poythress played in 238 games for the Jackson franchise from 2009-2013 giving him the nickname “The Mayor” ala his twitter handle @TheMayorRP. He batted .276 (236×854) with 52 doubles, 20 home runs and 122 RBI.